The last time Hollywood writers went on strike, almost two decades ago - a strike that has had lasting consequences - David Letterman stood on the set of "Late Night," looked out at his studio audience, and experienced a version of the classic Actor's Nightmare. "We have nothing to do," the talk-show host said. "The writers aren't here." To fill the time, he got a shave on the air. Johnny Carson, then host of "The Tonight Show," was also at a loss. ''It is not fun to come to work when you see your friends who you've known for many years standing out on a picket line,'' he said on air. 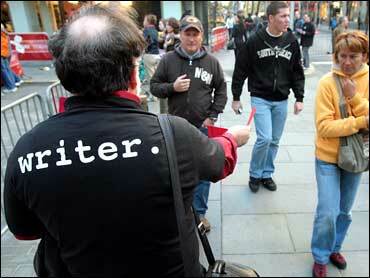 "And it's a weird picket line: The writers are out there holding up these signs and there's nothing on them." But the 1988 strike by the Writers Guild of America did not produce so many fresh jokes. For one thing, the airwaves were filled with reruns. And not too much was funny. The strike lasted 22 weeks, reportedly cost the industry $500 million, and caused hardship for individual strikers. Some were forced to adjust in creative ways. Fran Drescher and her husband Peter Marc Jacobson (later co-creators of "The Nanny") launched a good business, Loaf & Kisses Gourmet Croutons, which kept going. The strike also resulted in a changed cultural landscape. The fall television season was delayed, and several shows were permanently canceled. Much of the public stopped watching television - and 10 percent never returned. To fill the hours with something other than repeats, the networks looked to what was then alternative programming. So-called news magazines such as CBS' "48 Hours" rose to prominence during the strike. And Fox picked up a show called "Cops" from a local station, and put it on its Saturday night lineup, where it remains, 20 seasons later, the longest-running of what is now being called reality television. Some say that the strike helped create this peculiar genre of unscripted shows, which fill much of the primetime schedule and, if there is another strike in 2007, is likely to take up even more. When the strike ended, the writers did not get all that they wanted, such as more payment for reruns broadcast overseas. Indeed, the essential dispute between the Writers Guild of America and the Alliance of Motion Picture and Television Producers remains -- how (and even whether) writers will be compensated when new technology results in new ways of presenting their work. It is at the core of the conflict in 2007 as well.